Hake is Spain’s favourite fish but much less popular in the UK, which is something of a mystery to me. It’s a sustainable catch and it tastes terrific, but most of the hake landed here every year gets shipped to Spain. 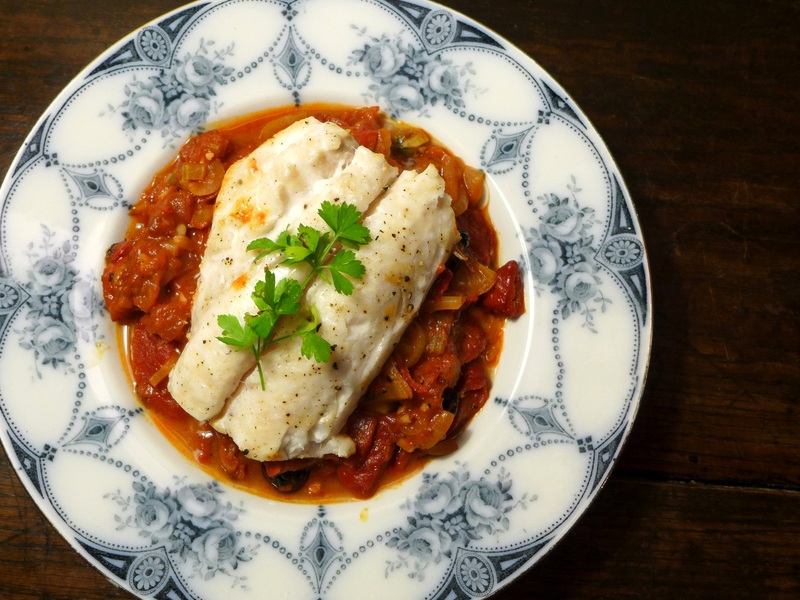 It’s surely time to repatriate it (insert Brexit joke here) but this recipe also works with cod or any other firm-fleshed white fish. It seems only fair to borrow something from the Med for the base: it’s a version of peperonata, an Italian pepper ragout. I used bottled peppers for speed and convenience but if you’d prefer to make your own, grill or barbecue the peppers until the skins are black and blistering, then put them in a food-safe plastic bag for half an hour. The skins will peel off easily, if messily. They’ll need slightly longer to cook than the bottled peppers. Anchovy haters will find that the salty little fish vanish into the sauce, just adding depth of flavour, but if you’re not convinced, swipe a Spanish ingredient and use a handful of diced chorizo instead, thrown into the pan before the onions. And if I was making this in the summer I’d use fresh, full-flavoured English tomatoes (skinned) but as I’m not, I’ve gone with tinned Italian tomatoes, which are infinitely better than the watery winter offerings from most supermarkets. Heat the oil in a deep, oven-proof casserole. Fry the onion and celery, if using, until soft and golden but not browned. Add the garlic and fry gently for two minutes more. Break up the anchovy fillets and stir them in so they melt into the onions. Add the tomatoes, peppers and chilli flakes and cook on a low to medium heat until thick and soupy. Stir in the olives and capers and grind in some black pepper. You may not need additional salt, but check and adjust to taste. Season the fish on both sides with salt and pepper then sit them, skin-side down, on the tomato and pepper mix. Bake in the oven for 12-15 minutes or until the fish is translucent. Don’t overcook it or you’ll spoil what is a delicate fish. Scoop carefully onto warmed plates, scatter with a few herbs and eat with crusty bread or, in season, baby new potatoes. 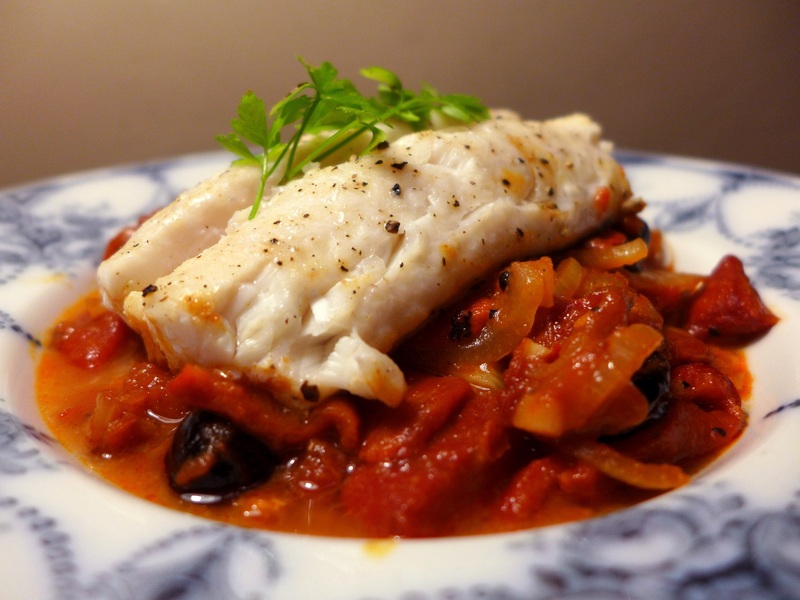 This entry was posted in Fish and shellfish, Mains and tagged baked hake with med veg, baked hake with Mediterranean vegetables, hake by Linda Duffin. Bookmark the permalink. This sounds good. I’m doing senior moments though, as I initially read this as haké and wondered what on earth it could be. Yes, hake’s a nice fish. 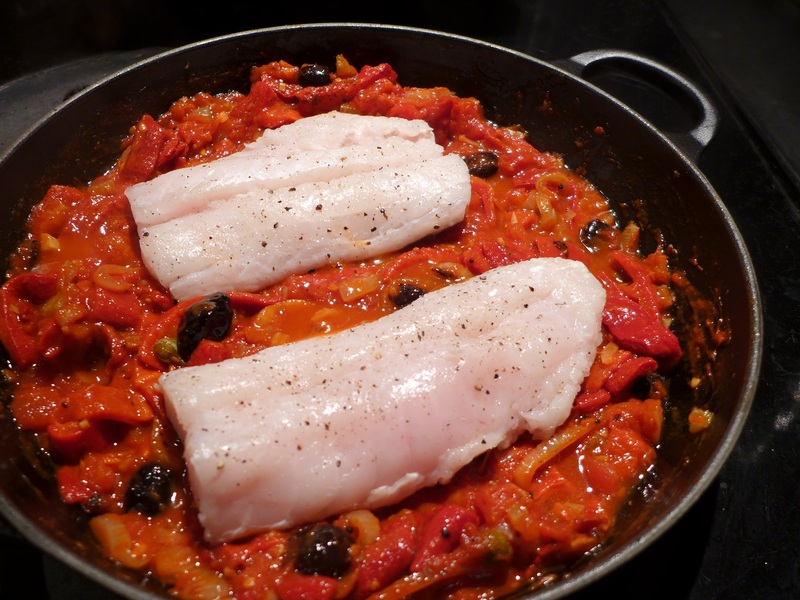 No hake in Oz but it looks a similar texture to goldband snapper which I know would be delicious perched on peperonata. Thanks for connecting the two for me, it will be done in a day or two…. I’ve never prepare peperonata with seafood before, Linda. We’ve always served it with pork sausage, if anything. We do serve baccalà (dried, salted cod) braised in tomato sauce and I bet that it would work great if roasted peppers were included, too. This is something I’m definitely going to try and perhaps very soon. Traditionally, baccalà was one of the dishes my family served on Christmas Eve. Circumstances may prevent me from doing so this year but there will be plenty of opportunities to prepare baccalà over the holidays. Thanks for sharing your recipe.